We’re Live and Alive! Josh talks about his flight with an annoying lady. John crack jokes about United Airlines. Josh talks about how John won 2 awards in a row at MicroConf. John talks about going to nightclubs in Vegas, and getting girls to go to a club. Chuck talks about how he has no interesting nightclubs. So that was Vegas… John ask how Chuck like MicroConf. 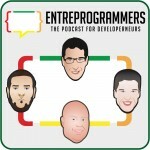 EntreProgrammers talk about their thought about the events at MicroConf. EntreProgrammers continue on their thought on the talks and event organization at MicroConf. John says that because they’ve been to tons of conferences in the past, they have heard it all and noting new is happening in the world of marketing. Chuck says that after learning from MicroConf., he feels like he should cancel the rest of conferences he has schedule until he gathers more information. Josh suggest looking at the math and his list. Chuck talks about the last funnel he was building to gain more people on his list. Josh suggest growing the audience would be quickest for Chuck. Chuck is think about doing somethings for free and Summit event as a land grab. Josh ask Chuck about how long does it take for Chuck to set up the conference events. Josh suggest looking at the costs first. John talks about having a mountain of email during traveling. Including taxes. Chuck talks about his tax situation. John explains pay taxes as you go up the tax bracket. Death and Taxes..
Chuck talks both doing an Audience Survey with his assistant’s help, and mistakenly gets 11,000 emails because they did not check a certain box in Drip. Chuck ask if anyone had some major takeaways from MicroConf. John talks about a ideas and new ways to do things at Simple Programmer. Josh talks about how most of his takeaways were from talking to people at the conference. Chuck says the conference have become generic, and most great information come from talking to people. John – Beliefs and contrast. Chuck – Open up and be honest at conferences. Josh – Physical proximity works best.